When you think about swoon-worthy dishes, what comes to mind? In Julie and Julia, it was the crunch of the olive oil-toasted bruschetta bread covered with juicy tomatoes. Remy the rat has his first food-wakening when his foraged fromage, wild mushroom and herbs get flambeed by a bolt of lightning in Ratatouille. In Chocolat, the swoon subject is obvious—No, not Johnny Depp, the chocolate for heavens sake! My favorite food scene comes at the end of Big Night, where the restaurant guests bite into the Timpano. And if you’ve ever seen Chef, I just have three words for you: Grilled. Cheese. Sandwich. My friend Karissa and I enjoyed a swoon-inducing eggplant while eating at a fantastic Turkish restaurant in Houston. The kind of dish where you revert to some kind of primal foodie language that consists of mmms, sloshy sounding consonants, and repeated “s’really good”. It turns out, we weren’t the only ones captured by the eggplant’s swoon power. Traditionally, the story goes, the eggplant was braised so indulgently in olive oil that the Imam fainted upon trying it. 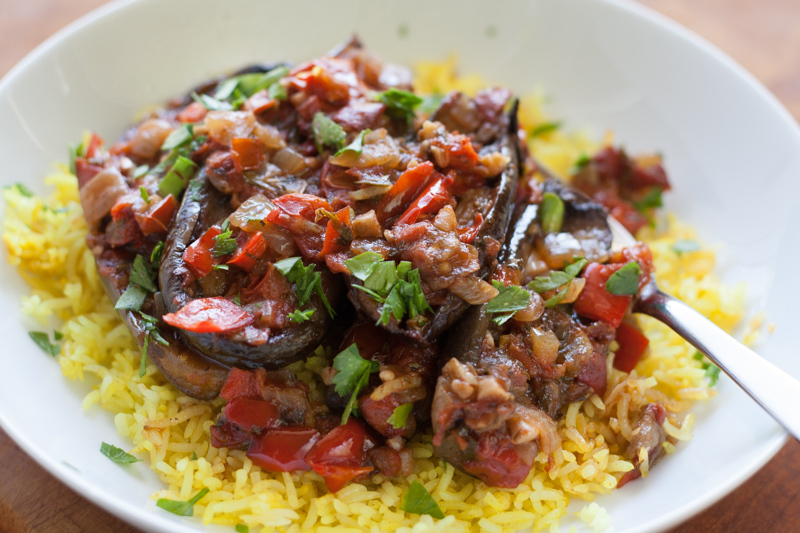 This particular eggplant was braised, stuffed with a perfectly seasoned mix of onions and peppers, topped with spiced tomato sauce, and served over aromatic yellow rice. I get fixated when I’ve eaten something really good. I need to be able to make it anytime I want, in my own kitchen. My fixation included daily visits to the back yard to peek under the leaves of my japanese eggplant, which produced over 20 of the little buggers in the space of a breadbox. When they were big enough, my wait was over. Talk about slow food! The last farmers market days are upon us here in Colorado. It’s high time to scoop up the last of those in-season eggplants, tomatoes, and peppers, and cook them down into something to punctuate the end of the home-grown produce season. Bet you never thought eggplant could make you swoon. Eggplant is the new dark chocolate raspberry truffle cake, the new Tango de la Muerte, the new Leonardo DiCaprio. Keep your fainting couch close by, and enjoy! Preheat the oven to 400˚F. Cut the stems off the eggplants and halve them lengthwise. With a sharp knife, score the flesh of the eggplant as follows, being careful not to cut through the skin: one slit lengthwise down the middle, then diagonally crosswise in 1 inch intervals. Arrange the eggplant halves face up in a large casserole dish. Sprinkle them with a few big pinches of salt, and allow to sit for 20 minutes. 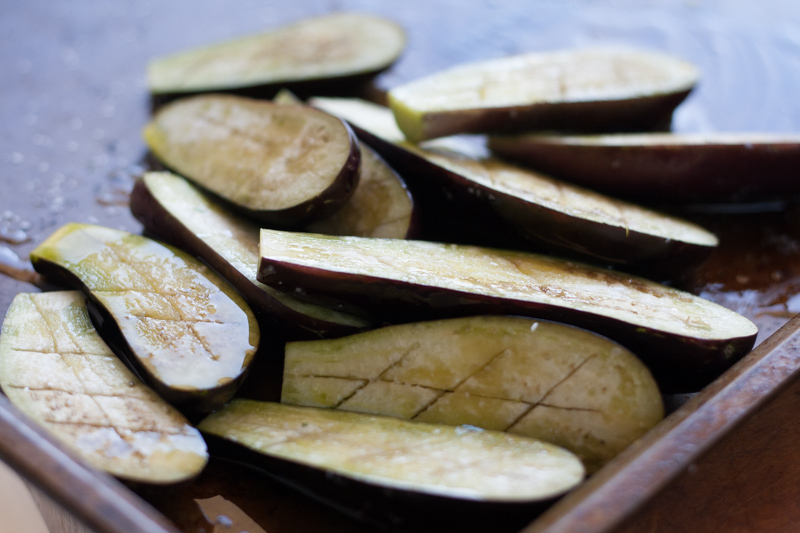 Drizzle the eggplant with ¼ cup of the olive oil, then sprinkle with allspice and sumac or lemon zest. Bake in the oven for 20-25 minutes, or until the skin starts to wrinkle and the flesh is tender. In the meantime, heat the remaining ¼ cup olive oil in a medium saucepan. Sauté the onion and bell pepper over medium high heat until soft. Add the garlic, and sauté for 2 more minutes. Pour in the white wine if using, and deglaze the bottom of the pan, stirring for a minute or so. Stir in the tomatoes. Reduce heat to medium low, cover, and cook for 10 -12 minutes until they have released their juices, stirring occasionally. Add cumin and cinnamon, and season to taste with salt. Reduce heat to low and simmer for 40 minutes until very soft and saucy. Stir in the lemon juice and fresh herbs. Season to taste with salt. I love combining rice with aromatic spices in my rice cooker. With minimal effort, you can customize rice with spices and other ingredients that complement the main dish. The turmeric gives this rice its vibrant yellow color, and is said to have many health benefits. Curcumin is the active compound in turmeric and has anti-inflammatory and anti-oxidant properties. If you don't have a rice cooker, the rice can be made according to the package directions, with the addition of the ingredients below. Place all ingredients in a rice cooker and cook. Remove the whole spices and bay leaves before serving. Swooning already. You’re an uber-talented chef, but my goodness. Your ability to describe delectable dishes is downright dazzling. And your cooking, always DELICIOUS. Thanks Morgan:)! Your comments always make me happy! This eggplant dish looks fantastic! Could you tell me when and where you use the white wine/vermouth?